A simple appetizer that will thrill vegans as well as meat-eaters! 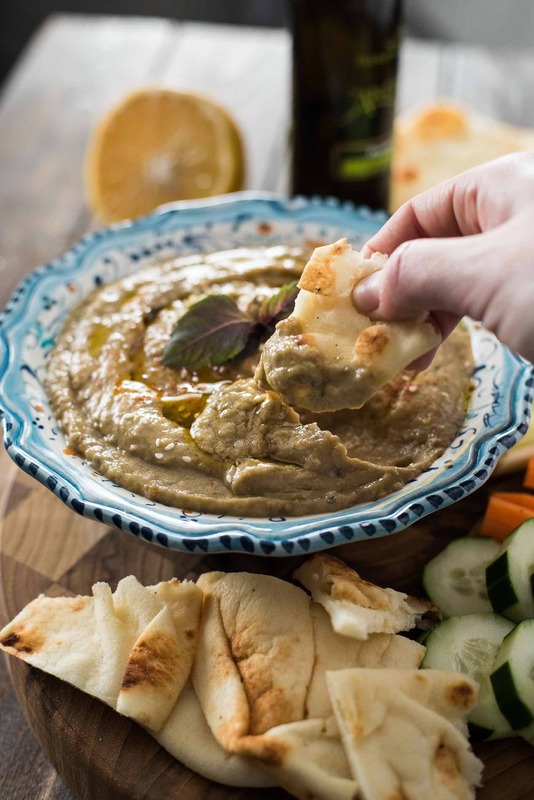 Smokey, slightly chunky, and loaded with flavor, this traditional eggplant Baba Ganoush recipe is kicked up with a touch of cumin and paprika, plenty of garlic, and fresh Meyer lemon juice. I’m here to take you to funky town. 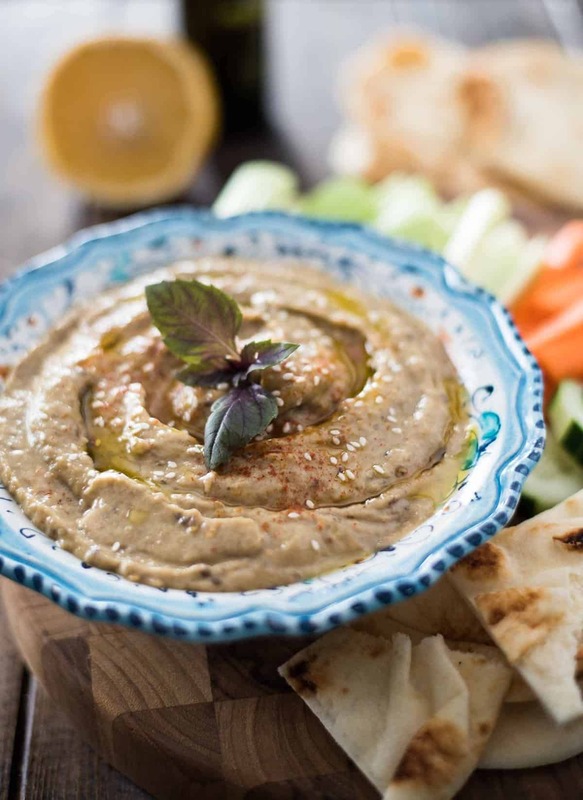 What are your thoughts on simple Middle Eastern dips so heavenly, they make tears involuntarily fall from your eyes? Obviously hummus comes to mind, as it should. It’s delicious and incredible and you can find 32 varieties at any grocery store. Homemade hummus has been on my to-do list for aaaaages, but here we are, ogling at it’s aubergine-based brother instead. Blame my bad habits of shopping for produce with intention, and then failing the follow-through. This Baba Ganoush is mind-blowingly good. Yep, the chickpeas got passed over in favor of a few farmers market eggplants on the verge of being fertilizer. But since I’m now the proud owner of a rather large jar of tahini, you can bet that you’ll see a recipe for hummus on here sooner or later. 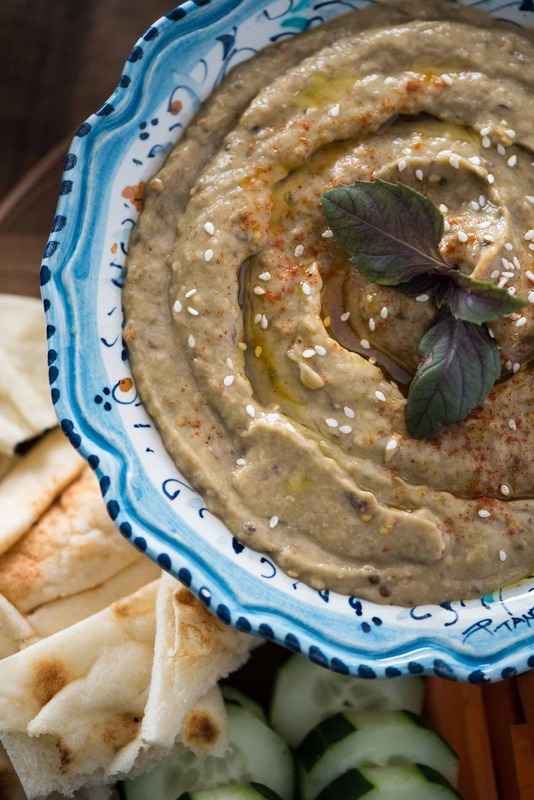 Likely sooner, since now that I’ve tried baba ganoush I want to dip all the things. But seriously. After the platter of veggies and pita that I used for this shoot was gone, I started rummaging through my fridge to see what else I could douse in the garlicky, lemony goodness that is this baba ganoush. This is coming from a guy who ate so many hot garlic wings one night, we had to open the windows on the ride home because the smell was coming out of his pores. It was repulsive, even to him. He was a walking vampire repellent. Two showers later and finally he smelled like a human again. So, tread with care as far as that goes. And don’t go crazy with the cumin, either – unless you like your baba to taste like Taco Bell ground beef. This recipe is perfect for 2 or 4 folks with respectable appetizer appetites, but is easily doubled, tripled, or quadrupled if you happen to have a larger crowd to feed. Or if you’re just an aubergine glutton, which I couldn’t blame you for. Dip on, friends! Preheat oven to 400 degrees F. Cut the eggplants in half lengthwise and brush the cut sides lightly with 1 Tablespoon olive oil. Place on a foil-lined baking sheet, cut side down, and roast 35-40 minutes, until very tender. Allow to cool for 15 minutes. Scoop the soft eggplant flesh into a strainer set in a large bowl, pressing out excess liquid. Discard liquid and transfer eggplant to a bowl, then mash well with a fork. Add the garlic, lemon juice, tahini, and remaining olive oil, pepper, salt, and cumin. Mash well, aiming for a somewhat smooth texture, but still retaining some chunks of eggplant. 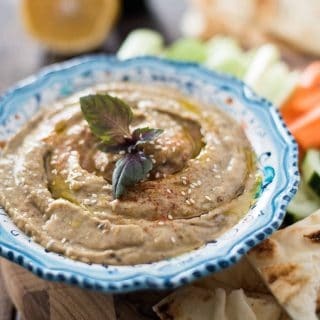 Chill the baba ghanoush for 1 hour, then season to taste with additional salt, pepper, and/or cumin. When ready to serve, swirl a little olive oil on the top, and sprinkle with sesame seeds and fresh basil or parsley. 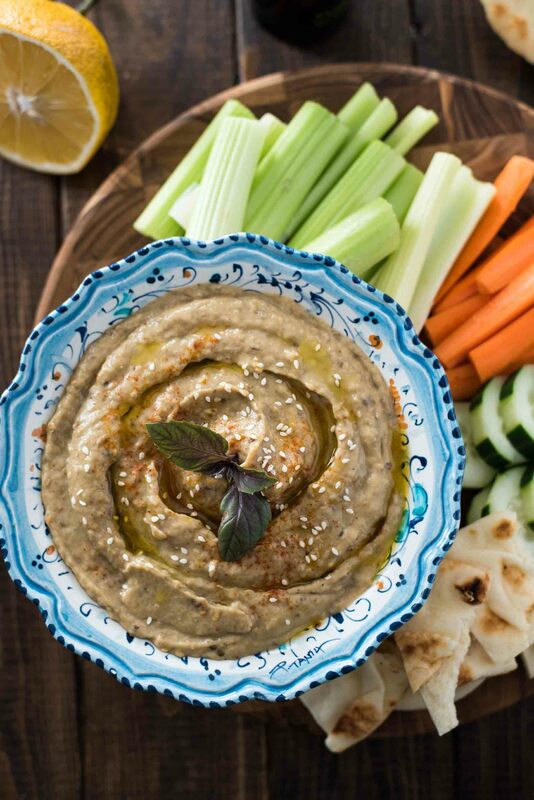 Serve with pita bread or chips, carrot sticks, celery, or cucumber slices. Enjoy! Got a fancy party coming up? Show up with 1 or 2 of these yummy appetizers and you’ll be everyone’s favorite guest! I have always wanted to make Baba Ganoush! 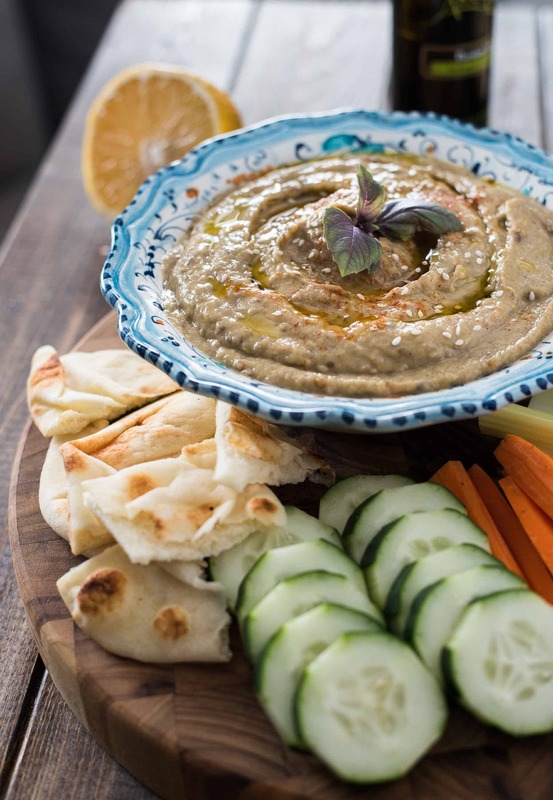 We make a ton of homemade hummus here (because yes, we also have a crazy large jar of tahini to use) – also, “Blame my bad habits of shopping for produce with intention, and then failing the follow-through.” – also ME. Ha ha. I eat a lot of homemade hummus and I have the fear of wreaking of garlic! 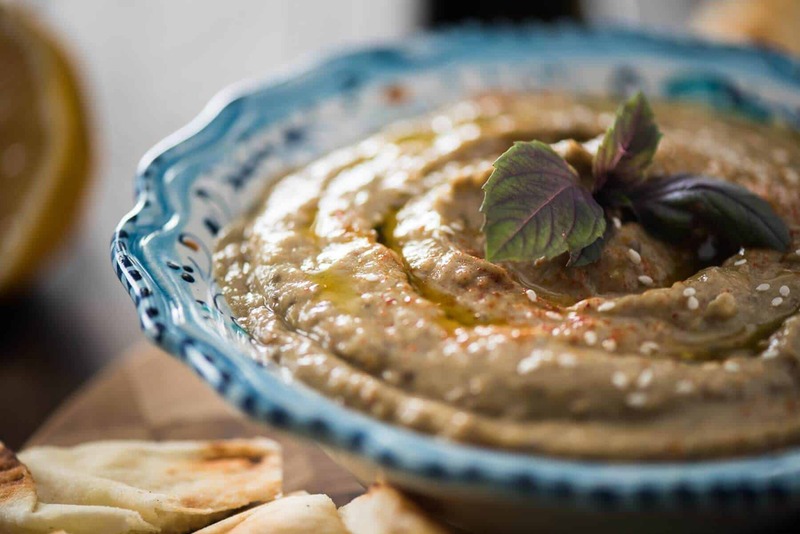 Your baba ganoush is beautiful! I love baba ganosh!! YUM!!!!!!!!!!! Hi Erica, Baba Ganoush has been on my too-do list foreveer. I could live off this stuff. I bet this is delcious! I will choose baba ganoush over hummus any day, hands down. You know what I would have dipped into it when I ran out of veggies? A spoon! I love the touch of Meyer Lemons, so fresh tasting! Abel and I have the same mantra! “there’s never too much garlic or salt” for sure. 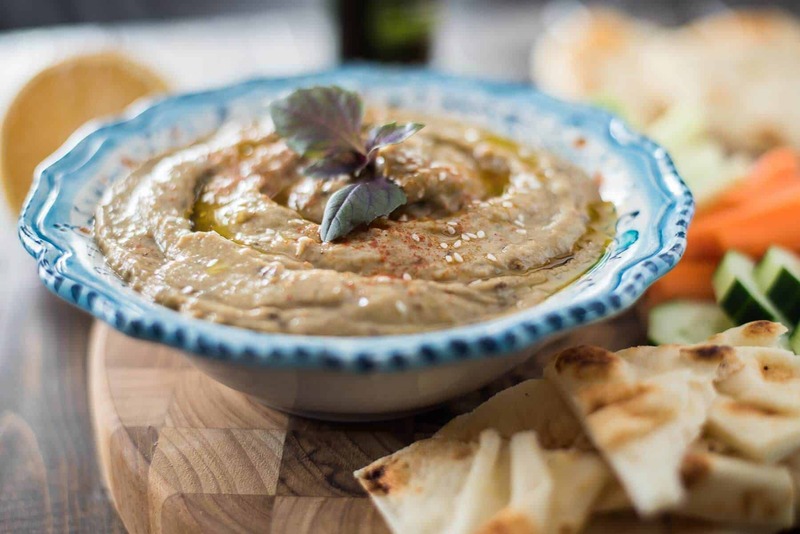 I tell everyone that comes for dinner at my house, ‘I hope you like garlic’ haha So anytime you are down south my way, you come and get your garlic on for dinner 😉 I haven’t had baba ganoush in soooooo long! This brings back good memories of dining out at a local place with friends. I’m so glad you shared this, and I can’t wait to give it a try. Full on garlicky goodness!! Thanks, Erica!